I have R1, R2, R3, and R4. I want to use Transparent Cisco IOS Firewall to help create a security policy that I can apply to R2. R2's Fa0/1 is connected to R1 and is considered the INSIDE network. 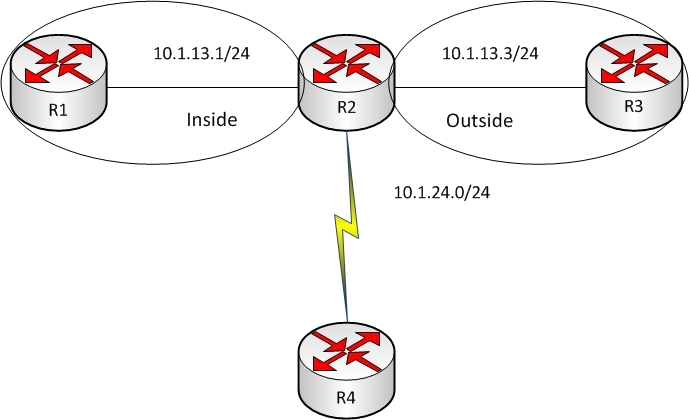 R2's Fa0/0 is connected to R3 and is considered the OUTSIDE network. R2's Se0/1/0 will connect to R4's S0/1. R1 and R3's FastEthernet interfaces are part of the 10.1.13.0/24 network, which requires R2 to bridge between the two interfaces. I want to allow R1 to access R3's http service, but not be allowed to telnet to R3. I want R3 to be allowed to telnet to R1, but not be allowed to access R1's http service. I want both R1 and R3 to be able to access R4. Since R1 and R3 are both on the same subnet, my first step is to configure bridging on R2. I will apply the bridge group to the two FastEthernet interfaces, enable a BVI interface, and assign it an IP address on the 10.1.13.0/24 network. The fa0/0 and fa0/1 interfaces are already enabled on R2 with no ip addresses assigned, and there have been no rules configured to filter any traffic. At this point, I should be able to ping between R1 and R3. Next I'll write the ip inspect rules for the OUTSIDE and INSIDE interfaces. I will also need to write ACLs for the INSIDE and OUTSIDE interfaces to allow access for the INSIDE to R3 on TCP 80 as well as sending echo and echo replies. I also want to allow access for the OUTSIDE to telnet to R1 as well as sending echo and echo replies. Now I'll apply the ip inspect rules and ACLs to the correct interfaces in the correct directions. R1 should still be able to ping R3. But, R1 should not be able to telnet to R2 due to the ACL applied to R2's fa0/1. As expected the ACL allows the sending traffic. The debug should show the result of the return traffic. With the telnet session open, I will verify that a session is open and being inspected.